Many of the iconic landscape scenes painted by Hudson River School artists, now hanging in major museums all over the world, are the breathtaking views surrounding the Hudson River Valley. Thanks to preservationists and conservationists, several of these vistas remain remarkably similar to their 19th-century appearance and are instantly recognizable. Many, however, are not. A new exhibition at Boscobel House, Reflections Renewed: Hudson River Images Revisited, will offer a side-by-side exhibit of “now &amp- then” photographic reproductions of Hudson River School views. 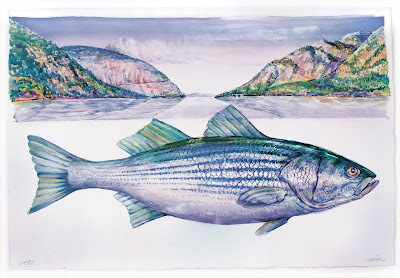 Boscobel’s guest curator for Reflections Renewed is Alexander Boyle, son of Robert H. Boyle, author of The Hudson River, a Natural and Unnatural History. Alexander Boyle grew up in Croton-on-the-Hudson and Cold Spring. He co-authored and published the groundbreaking book, Acid Rain in 1983 and graduated with a B.A. in history at Trinity College in Hartford, CT.
Boyle later worked for the Metropolitan Museum of Art as assistant director for the film, American Paradise whose broadcast on PBS coincided with the exhibition American Paradise, the World of the Hudson River School. Boyle is also a former VP of Godel &amp- Co. Fine Art where he wrote numerous exhibition catalogs on 19th and early-20th century American paintings. Boyle has also published various articles on American marine painting, painted images of American lighthouses and the emergence of the Hudson River School for various esteemed art publications. 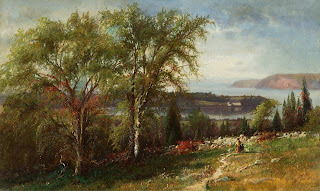 His article on the Hudson River School was extensively used in the 2002 PBS film, America’s First River, Bill Moyers on the Hudson where Boyle was featured. Boyle also recently published in QUEST Magazine an extensive guide about where exactly the Hudson River School artists painted. “This exhibition was born by the preservationist movement of the mid-20th century. And while we can’t turn back the clock to when the Hudson River was first captured on canvas, the clean-up laws enacted circa 1970 worked, and in many places certain vistas that were painted by the Hudson River School might be regarded as better looking today than long ago. The process of identifying these iconographic locations has just begun, but if this show is a good sample, they are a joy to behold and even a greater marvel to know somehow they still exist. They did not survive by accident so we give thanks to those came before us and preserved that land we Americans hold sacred,” Boyle said. The exhibit will remain on display in the exhibition gallery through December, 2012. Gallery Talks hosted by Mr. Boyle are scheduled for November 10 and December 29, 10am-11am. The exhibition is free with a paid House or Grounds admission. For pricing and hours, please visit Boscobel.org. Boscobel is located on scenic Route 9D in Garrison New York just one mile south of Cold Spring and directly across the river from West Point. From April through October, hours are 9:30am to 5pm (first tour at 10am- last at 4pm)- November and December 9:30am to 4pm (last tour at 3pm.) Boscobel is open every day except Tuesdays, Thanksgiving and Christmas. 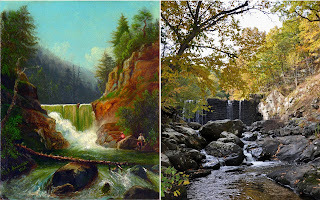 Illustration: Frank Anderson (1844-1891), Popolopen Creek, 1863 and Alexander Boyle, Popolopen Creek Falls, 2009.